Egypt’s President Abdel Fattah al-Sisi and Speaker of the House of Representatives Ali Abdel-Aal pledged their back for Vietnam’s efforts to strengthen its relations with the Middle East and Africa. The two leaders made the commitment at their separate receptions for Vo Van Thuong, Politburo member, Secretary of the Communist Party of Vietnam Central Committee and head of its Commission for Information and Education, who is on a working visit to Egypt from May 23-27. They affirmed that Vietnam is a friend and trusted partner of Egypt in Southeast Asia. They hoped the two countries’ relations will help boost Egypt’s ties with the region. 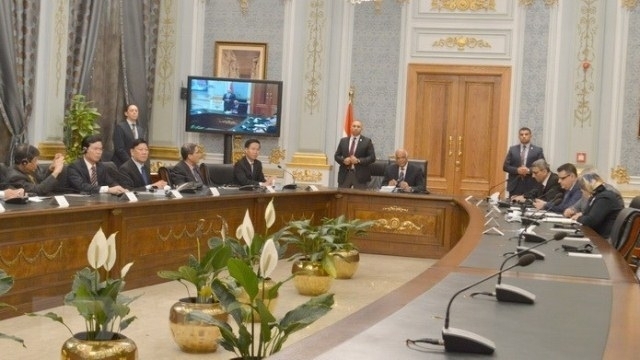 Egypt is speeding up the implementation of memoranda of understanding and agreements it signed with Vietnam, and willing to create all favourable conditions for Vietnamese investors, they stated. They also suggested both sides intensify collaboration in tourism, culture and people-to-people exchange. For his part, Thuong briefed the hosts on Vietnam’s socio-economic situation and its outstanding achievements in more than 30 years of renewal. He confirmed that Vietnam always bears in mind the support of Egypt for its past struggle for national liberation and current national building and development. He expressed his belief that with strong political determination of the two countries’ leaders and legitimate aspirations of their people, Vietnam and Egypt will maintain close coordination and support at regional and international forums for the interests of the people and for peace, stability, cooperation and development in the region and the world. The Vietnamese official also had meetings with leaders of the Egyptian Communist Party and the Socialist Party of Egypt, during which he affirmed that Vietnam is always a loyal friend and a reliable partner of other countries. In his meetings with Egypt’s Foreign Minister Sameh Shoukry and Minister of Communications and Information Technology Yasser El-Kady, Thuong said that Vietnam attaches importance to strengthening its relations with Egypt and appreciates the country’s role in the Non-Aligned Movement as well as its efforts to maintain peace and stability in the Middle East. The Egyptian side expressed hope to learn from Vietnam’s experience in developing fisheries, rice cultivation and ship building, and enhance cooperation in information technology and communications, cyber security, software manufacturing, renewable energy, education and culture.